his experience of trading futures and ETFs. You call yourself the “Gold and Oil Guy”, are the gold and oil sectors are your specialties? I follow gold and oil closely and give my analysis, thoughts and trades ideas to my followers each morning before the market opens. While I follow them closely the SP500 is my baby and what I prefer to trade. I found that emotions run wild in the stock market and once you understand what state of mind the majority of traders are in, then you are able to accurately track and forecast future moves 1-3 days in advance. How did you get started trading? I started years ago in college trading from my laptop. It didn’t take long before I decided this was what I was meant to do for a living. I have never stopped since. I work with several financial websites and professional traders each week and trade each day either managing swing trades or taking a day trades. What instruments do you trade the most? How did you choose the time frames you trade on? Choosing the time frames to trade took many years of trial and error. But I did eventually find a couple time frames which have proved to be VERY accurate when trading the SP500 specifically. Money flows in and out of the market in waves (cycles) and once I realized these cycles and could identify fear and greed in the market place finding and timing trades was the difference between night and day. The really exciting thing about the SP500 and its cycles/timeframes is that I can trade full time and have trades almost every other day or site back and wait for the longer term swing trades and enjoy time with my family, friends and exercise. I have built a trading system that automatically breaths with the market using current volatility levels, various cycles, buy/sell volume levels and momentum and it alerts me in pre-market trading each day if I a buy, sell or position adjustment is to be made. The time frames I focus on are the daily, 30 minute, 10 minute and 3 minute. Do you trade leveraged instruments? Do you trade them differently from non-leveraged investments? I trade all types of instruments based around the SP500. In short, the more leverage I use the smaller the position I take and the shorter term the trade is. For example I will trade the ES mini futures for day trades which are always closed out at the end of the day. Momentum trades which last 1-3 days I will use a 2x or 3x ETF like SSO or SPXU to get more juice from a play but maintain a healthy risk level as overnight trading and price gaps cut both ways. Swing Trades I take the largest positions in up to 50% of my trading account in a single position using a 1x ETF like the SPY. These trades can last up to 4 months at times. I do at times make things a little more complicated when trading with a strong trend. Sometimes when I get a swing trade buy signal I will buy a position using the 1x ETF. If in the next 3 days I get lower prices of more than 1% against me while the uptrend remains alive I will add more of a position using a 2x and 3x ETF also. Once the market bounces back a little I close out the leveraged positions to a quick gain and continue to ride the swing trade. 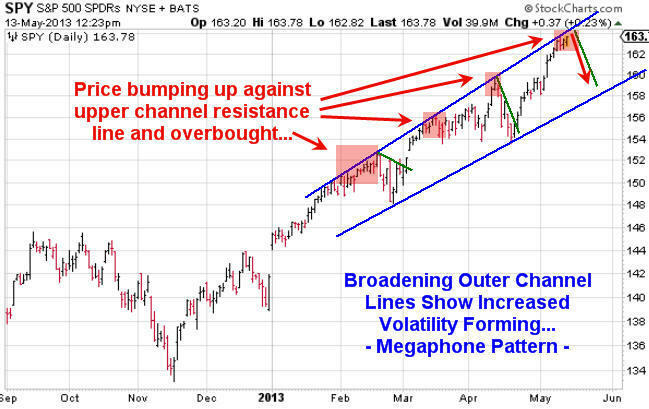 I do this same thing in down trends when I am on a hot streak and in the zone with the SP500. What has been your biggest hurdle becoming a full time trader? The toughest part of trading for me is keeping laser-beam focus on my strategy as it is mandatory for success. I work with, talk to and read a lot of market opinions of other traders each day and it can cloud my judgment causing me to break my own rules. In your opinion, what do most traders don’t realize about the “game” of trading? Most traders/investors do not understand risk/reward for positions. I would say 90% of people I talk with take much too large of positions in investments which carry very high risk. Also they do not use protective stops based of technical analysis/risk tolerances. Those are the two main things, but this list could go on and on… There are a lot of moving parts in the market and each must be closely monitored, managed and understood clearly. Again, It’s better to be really GOOD AT ONE THING than average at a bunch of things meaning you should be jumping around trading random stocks, sectors, commodities and investment types like options, equities, forex etc… Just learn one, master it and then expand. Without revealing your proprietary method, could you please tell us what tools you use for trading? Any specific indicators? I am a technical trader so I focus 100% on Price, Volume and Momentum. News, economic data and rumors mean absolutely nothing to me. The only thing that pays traders is price action so that is what I follow. It’s simple supply and demand. High volume means there is power behind a move and momentum is how fast the price is moving on various time frames. As long as you trade with the daily trend direction forget about picking market tops or bottoms you instantly have the odds in your favor. Problem is people always want to try and outsmart the market by going against the trend and trying to pick these tops and bottoms. As for the indicators I use. Again they are simple and based off price, volume and momentum. Each of my indicators has been customized for the SP500 and is unique. I do like stochastics and bollingerbands but they each need to be tuned for the underlying investment to provide a trading edge. What advice would you give new traders to start on the right foot? I would tell a new trader to spend a lot of time thinking about what their ideal/dream lifestyle would be like if they could choose. Do you want to be looking at the computer and trading every day? Or do you want to always be in positions and actively managing them on a weekly basis so you can enjoy life little more? Or A mix of both? Then you need to figure out what you would like to trade. Stocks, Options, ETFs, Futures, or currencies? Once you know these things then you should spend a lot of time looking for a successful trading doing EXACTLY what you want and do everything in your power and never give up to learn, master and live that lifestyle. Learning to trade is not cheap. You either lose a lot of money or spend a lot of money to fast track things… either way it’s going to cost you thousands of dollars. Personally I do a hybrid with laser-beam focus. I focus on only one investment (SP500). And I have learned and created my own trading system so I can day trade, momentum trade and swing it. This give me total freedom as I can spend 20 minutes a day looking at the market to manage my swing trade if needed and then walk away. Or can be replying to emails and see a setup unfolding on the intraday chart and take a quick trade and pocket a few hundred bucks on a day trade. Final question is about drawdowns. How do you handle them in your trading? Drawdowns are simple really… Depending on the type of investment you are trading the percentage amount will vary. But the same rule should apply. You should have a maximum loss per trade set so that you never blow your account up. Hopefully your protective stop is set way before that level is ever reached but sometimes price moves beyond normal volatility levels. My general rule is to never lose more than 1% of my account in a trade. So once I spot a setup and then calculate where my stop should be and figure out how much capital to put to work so that if my stop is hit I do not lose more than 1% of my trading account. Because I focus on the SP500 the volatility is low compared to trading individual stocks so moves in price as easy to digest and reduces fear/stress when in a position. Chris, thank you very much for sharing your experience with us and our readers. Best of luck on everything. Thanks a lot for this post and this Interview. Correction near but Bull Market has LONG waves to Go! 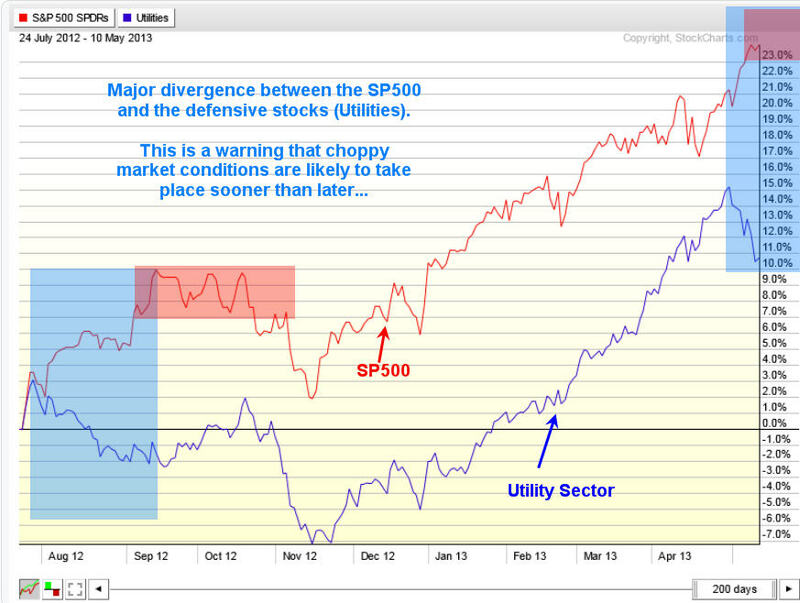 The SP 500 has been on a tear as we all know especially since the SP 500 bottomed at 1343 several months ago. * My work centers around forecasting using Elliott Wave Theory along with other technical indicators. This helps with projecting the short, intermediate, and longer term paths in the stock market and also precious metals. This larger picture Bull Cycle started in March of 2009 interestingly after an exact 61.8% Fibonacci retracement of the entire move from 1974 to 2000 lows to highs. * At 666, we had completed a major cycle bottom with about 9 years of movement to retrace 26 years of overall bull cycle. That was a major set of 3 waves (Corrective patterns in Elliott Wave Theory) from the 2000 highs to 2002-3 lows, then 2007 highs to 2009 lows. * Once that completed its work, we were free to have a huge new bull market cycle off extreme sentiment and generational lows. It’s important to understand where we were at in March of 2009 just as much as it is today with the market at all-time highs. Is this the time to bail out of stocks or do we have a lot more upside yet to go? Our short answer is there is quite a bit more upside left in the indexes, but there are multiple patterns that must take place along the way. We will try to lay those out for you here as best we can. Elliott Wave theory in general calls for 5 full wave cycles in a Bull pattern, with 1, 3, and 5 bullish and 2 and 4 corrective. We are currently in what is often the most bullish of all the patterns, a 3rd of a 3rd of a 3rd. In English, we are in Primary wave 3 of this bull cycle which will be 5 total primary waves. * We are in Major wave 3 of that Primary 3, and in the Intermediate wave 3 of Major wave 3. * That is why the market continues its relentless climb. This primary wave 3 still has lots of work to do because Major wave 3 still has a 4th wave down and a 5th wave up to finish, then we need a major 4, then a major 5. * That will complete primary wave 3. * This will then be followed by a Primary wave 4 cycle correction that probably lasts several months, and then a Primary wave 5 cycle to finish this part of the bull market from March 2009 generational lows… and all of that work is going to take time. * Once that entire process from March 2009 has completed, then we should see a much deeper and uglier correction pattern, but we think that is at least 12 months or more away. What everyone wants to know then is where are we at right now and what are some likely areas for pivot highs and lows ahead? * We should complete this 3rd of a 3rd of a 3rd here shortly and have a wave 4 correction working off what will likely be almost 300 points of upside from* SP 500 1343. We could see as much as 90-120 points of correction in the major index once this wave completes. * Loosely we see 1528-1534 as a possible top and if not then maybe another 30 or so points above that maximum into early June. * This should then trigger that 90-120 point correction, and then be followed by yet another run to highs. We could go on but then we will lose our readers here for sure, and as it is… this is all projections and postulations, so it’s best to keep the forecast to the next many weeks or few months. Below is a chart we have put together showing the structure of Major wave 3 of Primary 3 since the 1343 lows. Once that Major wave 3 tops out (see the blue 3) then we will have Major 4, then Major 5 to complete Primary wave 3 since the 1074 SP 500 lows. * Whew! The sell-side analysts and economists are reminding retail investors that risk assets in the United States have been on quite a tear to the upside recently. 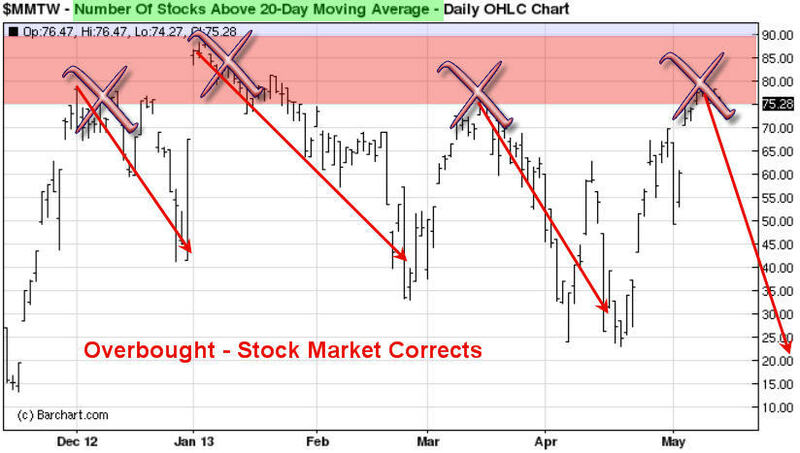 A correction now lasts a matter of days, if not hours before the bulls push equity prices even higher. The Federal Reserve is winning the reflation war using cheap money and massive levels of liquidity to help drive risk assets higher and interest rates artificially lower. Unfortunately for domestic investors searching for yield, they find that they are forced to incur higher levels of risk in order to satisfy their growth and income needs. There are significant risks associated with higher than average fixed income returns and the cost will be felt should we see any correction in the future. However, the Federal Reserve has a history that is littered with dismal results. The purchasing power of the U.S. Dollar has been reduced by more than 90% since the Fed’s inception in late December of 1913. Since that time, the Federal Reserve has stolen more “real” wealth from the American people than any other institution in the history of mankind. The Federal Reserve has two primary functions. One function is to maintain price stability or in other words to moderate inflation. Clearly over the past 100 years their inflation track record has been horrific. However, the Fed’s recent track record regarding the value of the U.S. Dollar Index has been dismal the past 15 years as shown below. As can be seen clearly above in the Dollar Index Futures monthly chart, at present levels the Dollar’s overall value has diminished well over 31% since late 2001. I would also draw readers’ attention to the selloff that occurred from late 2005 until the early part of 2008. The selloff during that period of time is important to reinforce my next consideration. Recently the flow of liquidity has primarily been seen in record low interest rates and a surging U.S. equity market. Nearly every day the Dow Jones Industrial Average or the S&P 500 Indexes make a new all-time high. The question that I would like to posit for readers is how long will it be before the so-called smart money starts looking at the attractiveness of commodities relative to equities? If the Federal Reserve continues to print money at this pace, what will ultimately stop them dead in their tracks? The short answer is energy prices. The easiest way to stop the Fed’s printing press is to see a massive spike in energy prices. While we often hear that history does not repeat but it often rhymes, consider the price action in oil futures during the same 2006 – 2008 selloff in the U.S. Dollar Index. It is readily apparent that once oil futures were able to push above the $78 / barrel highs in mid-2006, prices exploded while the U.S. Dollar came under strong selling pressure. The timing could not be more impeccable for the explosive nature in the move higher in oil. Furthermore, if we move forward to present day price action in oil futures we have a large triangle pattern on the long-term charts. The pattern offers the inflation versus deflation argument that so many economists and strategists are plagued by presently in their analysis. My suggestion is that watching the price of oil futures is likely going to tell us the intermediate expectation by the market of what lies ahead in the inflation versus deflation debate. The movement of oil futures prices in the intermediate term is likely to be based on which direction the triangle pattern ultimately breaks. What is obvious about this pattern is that a move that could hurdle $100 / barrel will open up a strong move toward $112 – $120 / barrel. If we were to see a move higher in oil futures that could push above the $120 / barrel price level set back in early 2011 a fierce rally in oil futures could play out. A strong rally in oil futures will ultimately put the final nail in the coffin for U.S. equity markets and the U.S. economy. Gasoline prices would obviously rocket higher and the U.S. economy would quickly be brought to its knees. The Federal Reserve would be forced to either print more money and run the risk of higher oil prices, or do nothing and run the risk that the equity selloff could intensify. I want to be clear that I am not calling for a rally in oil futures. Price action could go either way depending on market conditions, but the real question is regardless of which way price breaks in the future, how does it help equity markets? Those evil oil speculators run down by politicians seeking air time on television and radio could be the final straw for Ben Bernanke and the Federal Reserve. Whether the future is full of inflation, deflation, or stagflation I am confident that energy prices will play a critical role in price discovery for not just oil and oil distillates, but for the overall domestic economy. If the Fed does not show constraint at the appropriate time, oil and other commodity prices are likely to remind Chairman Bernanke that the Federal Reserve’s future track record is likely to be as dire as its historical performance. Since the middle of April everyone and including their grandmother seems to have been building a short position in the equities market and we know picking tops or bottoms fighting the major underlying trend is risky business but most individuals cannot resist. The rush one gets trying to pick a major top or bottom is flat out exciting and that is what makes it so darn addicting and irresistible. If you have ever nailed a market top or bottom then you know just how much money can be made. That one big win naturally draws you back to keep doing it much like how a casino works. The chemicals released in the brain during these extremely exciting times are strong enough that even the most focused traders fall victim to breaking rules and trying these type of bets/trades. So if are going to try to pick a top you better be sure the charts and odds are leaning in your favor as much as possible before starting to build a position. Below are a few charts with my analysis and thoughts overlaid showing you some of the things I look at when thinking about a counter trend trade like picking a top within a bull market. The SPY and XLU performance chart below clearly shows how the majority of traders move out of the slow moving defensive stocks (utilities – XLU) and starts to put their money into more risky stocks. This helps boost the broad market. I see the same thing in bonds and gold this month which is a sign that a market top is nearing. That being said when a market tops it is generally a process which takes time. Most traders think tops area* one day event but most of the times it takes weeks to unfold as the upward momentum slows and the big smart money players slowly hand off their long positions to the greedy emotion drove traders. Look at the chart below and notice the first red box during September and October. As you can see it took nearly 6 weeks for that top to form before actually falling off. That same thing could easily happen again this time, though I do feel it will be more violent this time around. Using simple trend line analysis we see the equities market is trading at resistance and sideways or lower prices are more likely in the next week or two. This chart because it’s based on a very long term moving average (150sma) is a slow mover and does not work well for timing traded. But with that said it does clearly warn you when stocks are getting a little overpriced and sellers could start at any time. General rule is not to invest money on the long side when this chart is above the 75% level. Rather wait for a pullback below it. 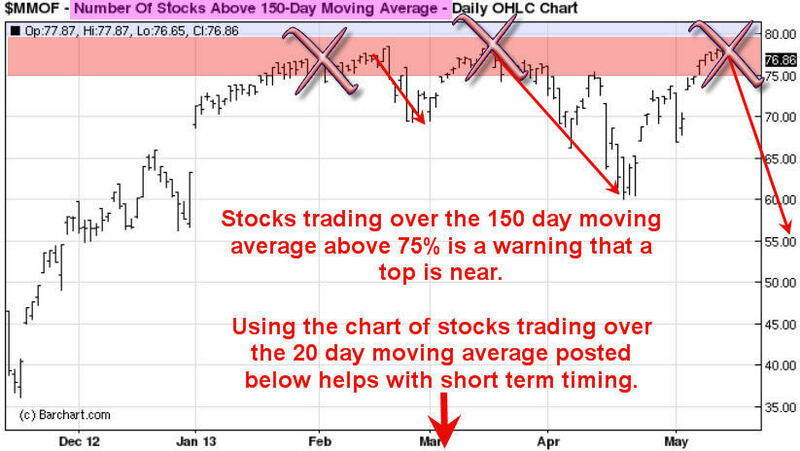 This chart is based on the 20 day moving average which moves quickly. Because it reacts quicker to recent price action it can be a great help in timing an entry point for a market top or bottom. It does not pin point the day/top it does give you a one or two week window of when price should start to correct. As we all know or will soon find out, trading is one of the toughest businesses or and one of the most expensive hobbies that one will try to master. Hence the 95-99% failure rate of individuals who try to understand how the market functions, position management, how to control their own emotions and to create/follow a winning strategy. With over 8000 public traded stocks, exchange traded funds, options, bonds, commodities, futures, forex, currencies etc… to pick from its easy to get overwhelmed and just start doing more or less random trades without a proven, documented rule based strategy. This type of trading results in frustration, loss of money and the eventual closure of a trading account. During this process most individuals will also lose friends, family and in many cased self-confidence. So the next time you think about betting against the trend to pick a top or a bottom you better make darn sure you have waited well beyond the first day you feel like the market is topping out. Stocks trading over the 150 and 20 day moving averages should be in the upper reversal zones and money should be flowing out of bonds and other safe haven/defensive stocks to fuel the last rally/surge higher in the broad market. Also I would like to note that I do follow the index futures and volume very closely on both the intraday and daily charts. This is where the big money does a lot of trading. Knowing when futures contracts are being sold or bought with heavy volume is very important data in helping time tops and bottoms more accurately. And the more experience you have in trading also plays a large part in your success in trading tops and bottoms. SRPT- *Sarepta is a Biotech that we alerted after a $13 pullback from $43 to $30 per share ranges. *At ATP we like to look for certain set ups that have fibonacci relationships and chart patterns , coupled with fundamentals and catalysts. SRPT- Sarepta- 29.90 time of alert A biotech with an advanced stage drug candidate for a form of Muscular Dystrophy, mostly that attacks children. The stock has had a huge run in the past year or so, but now a $13 almost pullback in 7-10 days allows a strong entry for aggressive partners only. We sold 1/2 on May 9th up 9.8% and held 1/2 with a $29 stop on close. *As of May 14th we are up 17% on that remainder 1/2. Active Trading Partners alerted our subscribers to buy Pandora Media on May 9th at 14.75 or lower. *We are closing out the trade this morning with 11% gains in under 5 trading days. *Some of our recent closed out trades include BLOX *up 9.8%, BYD up 30% in only 3 days, Pandora up 11% in only 4 trading days, and SRPT currently up 17% in 3 weeks and holding. Join us for profitable swing trade entries and exits that are updated daily and alerted in real time with full advice. I used to half joke with some of my investing friends that the best time to buy stocks is during or right after a crash. * Think 1987, 2000-2002, 2008-09, and now perhaps Gold Miners?? Well, before we get too far ahead of ourselves, lets examine evidence of a “Crash”: I like to use crowd behavioral, empirical, and technical evidence in combination. 1. * In a recent money managers poll, virtually nobody was bullish on Gold or Gold stocks, and over 80% of those polled were bullish on the SP 500 and US stocks. 2. * The percentage of Dumb Money traders (non-reportable traders) in the futures markets with short positions on Gold is at all time highs, they tend to be very long at the highs and very short at the lows. 4. The ratio of the HUI Gold Bugs Index to the SP 500 is at multi year lows and in near crash mode on the charts. The RSI Index (Relative strength) on the weekly charts is at 10 year lows at -13.71, which is off the charts low!! 5. * Most trading message boards I view at Stocktwits and others are universally bearish on Gold and Gold stocks. 6. * Gold is in a wave B or Wave 5 down re-testing the 1322 lows which we have discussed here for weeks as very likely if 1470 was not taken out on the upside… this is a normal sentiment pattern and re-test. 7. * Gold has been in a 21 Fibonacci month correction pattern off a 34 Fibonacci month rally from 686-1923. In August of 2011 I penned articles from 1805 right up to 1900 warning of a massive wave 3 top forming. * Everyone was bullish, now it’s the complete opposite. 8. Currency debasement continues around the world with negative real interest rates. This is bullish for Gold once this correction has run its course. Obviously Gold could end up going a lot lower than we think, and the Gold Mining stocks could sink further yet. But for those with a 3-6 month horizon, we expect the 21-24 month Gold correction to complete by no later than October 2013. * During the next several months the opportunities to buy some miners on the cheap will potentially make some investors a lot of money in the coming few years. Most recently it became obvious to us that the Gold Mining stocks were forming massive sentiment, fundamental, and technical bottoms all at the same time. Assuming we were right about a coming massive reversal in Gold Miners, we looked for the one that had the best combination of fundamentals, technicals and management. A crazy gain yes, but using our 10 day charts and combination of all other factors… it happened. We often see 7-9% gains within 1-3 days on our swings for this reason, and once in awhile a big one like MUX.